Swampscott Massachusetts is a town located fifteen miles north of Boston along the coast in an area known as the North Shore of Massachusetts Bay. It is bordered by Lynn, Salem and Marblehead Massachusetts. The town nicknamed "Red Rock", translated as such from "M'sqiompsk" the Native American name given and rightfully so as the view from offshore shows the large red granite rocky shoreline. The town of Swampscott known as the first resort town, a summer resort for the wealthy and in the 1800's some of the most beautiful hotels and resorts were built. This attracted the wealthiest of patrons, families and business men from across the country. Many stayed and built grand estates with fabulous homes, many containing ball rooms, which added to the history of the town. Industry in Swampscott was lead by fishermen and shoemakers followed by farmers and merchants. Swampscott is the home of the first tannery on Massachusetts Bay and is also where the dry fish process was perfected by Ebenezer Phillips, one of the countries first millionaires. Ebenezer Thorndike invented the lobster pot in the early 1800's revolutionizing lobstering, gaining worldwide recognition. In addition to the lobster pot, the invention of the unique flat bottom designed fishing boat used for pulling the lobster pots called The Swampscott Dory, a fishing vessel still in use today worldwide. 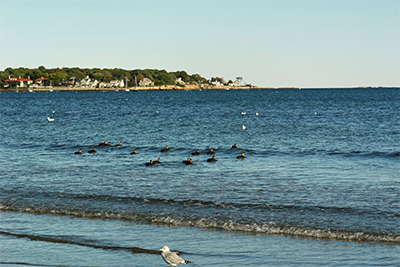 Today, Swampscott is a fairly affluent residential community, mostly suburban and is a friendly welcoming and nurturing family environment. Though the resorts and hotels no longer stand, many of the estates were divided and exquisite homes were built. There are three villages within the town, Beach Bluff, Phillips Point and Phillips Beach. Despite the rocky shore line, there are enough clearings to provide for the five beaches, several parks, ponds and forest as well as swampy areas in the northwest corner. Swampscott a family friendly environment offers an excellent education system from pre-school through high school as well as an abundance of youth sports. The public school system offers several pre-schools, five elementary schools, one middle school and a high school. In addition you will find six private schools and Marian Court College a Catholic college offering Associate and Bachelor degree programs.